The Rutland Road Drainage Upgrade Project was one of several undertaken by Fisher & Fisher on behalf of Casey City Council. Fisher & Fisher were commissioned to upgrade the under-capacity existing drainage network, which was being largely affected by the development of highly impervious properties throughout the catchment. The increased flow that was being produced by the altered catchment resulted in high volumes of water entering Rutland Road from the adjacent streets. 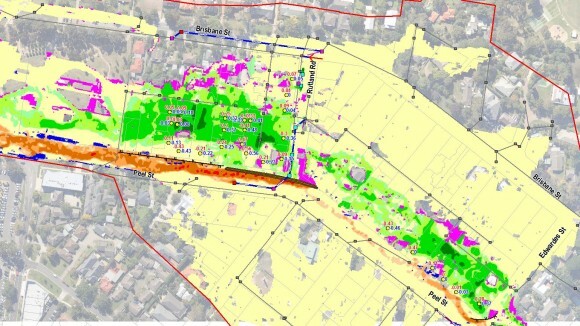 As with Haldane Street, which was discussed previously in the SOQ document, no overland flow path existed to alleviate flood waters and subsequently properties were being flooded. The solution provided by Fisher & Fisher was a 100 year ARI pipe, which is designed to deliver flows into the nearby Brisbane Street. The pipe has been designed to connect into the existing drainage, which allows low flows to travel down the existing network. Through precise hydraulic grade line analysis high flows have been designed to surcharge out of a pit. The surcharge pit was also especially designed to account for blockage and to release flows into the road reserve at a low velocity. The exit velocities, capacity of the road reserve to convey additional flows as well as the implications and affects on the downstream catchment were also investigated in the design process.